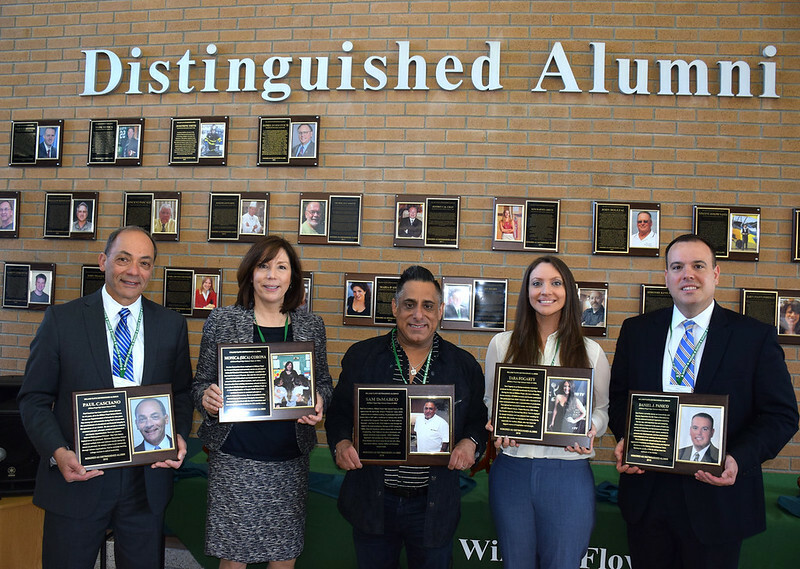 The William Floyd School District along with the William Floyd Alumni Association honored its 8th class of Distinguished Alumni, those who have made great contributions in their chosen career fields. The program is designed to inspire current students and reconnect with alumni and celebrate their accomplishments. This year’s class includes Paul Casciano, Class of 1970, a 41-year educator in the William Floyd School District including nine as superintendent of schools; Monica Corona, Class of 1981, a 28-year educator and 13-year principal at Nathaniel Woodhull Elementary School; Chef Sammy DeMarco, Class of 1983, a world-class chef, restaurateur and Travel Channel TV host; Daniel Panico, Class of 1996, Brookhaven Town Councilman and Deputy Supervisor; and Tara Fogarty, Class of 1999, an Emmy-nominated producer for the Rachael Ray Show. The day’s festivities began with a morning reception in the Rita Rech Museum of William Floyd School District History which gave the honorees time to meet and in some cases reconnect while viewing some artifacts and other William Floyd history. Then each distinguished alumni spent one class period interacting with large groups of students followed by a professional-quality catered luncheon prepared and served by William Floyd High School Culinary Arts students under the direction of Chef Rich Daly. The day concluded with an awards dinner at Lombardi’s on the Bay in Patchogue. Please scroll through the photos above and enjoy a video of the ceremony below.